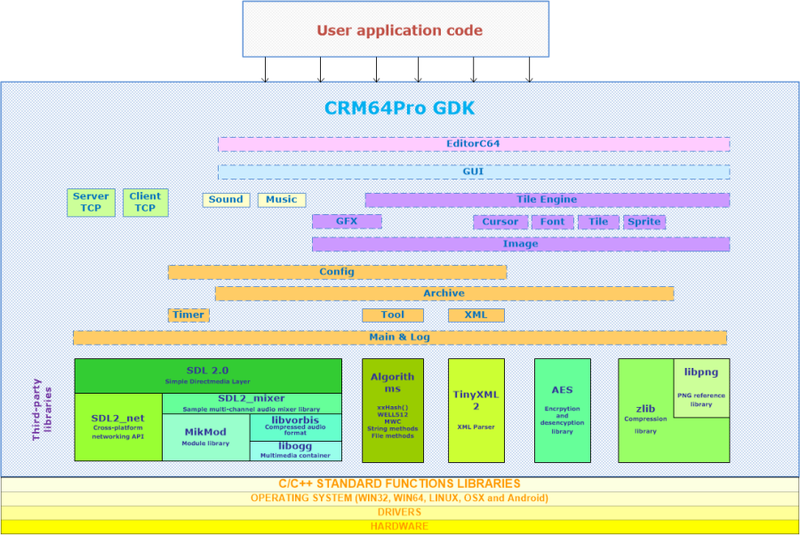 CRM64Pro is a free and open source cross-platform game development kit written in C++ and built on top of SDL 2.0. It is distributed under zlib license. Microsoft Windows 7 or newer, x86 and x64 versions. Linux distribution based on kernel 2.6.x or newer, x64 version only. MacOS X 10.10 or newer. Render and audio drivers availables for each platform? On this section you can find information about game development using CRM64Pro. - All projects are migrated to Visual Studio 2017. - New unified Position Helpers for Cursors, Sprites, Fonts and GUI Widgets. - Using TinyXML-2 4.0.1 (migrated from TinyXML). - Using xxHash 0.6.2 library. - Using libpng 1.6.29RC library. - Using SDL_mixer 2.0.1 (10-Jan-2017) library. - Using MikMod 3.3.10 (31-Aug-2016) library. Enable SSE2 instruction set usage. - ABI changed on all objects: for simplicity, Obj suffixes have been removed. - Using libpng 1.6.27 library. - Using SDL 2.0.5 b10726 (28-December-2016) library. Runtime libraries usually are shipped together with the application that uses CRM64Pro GDK but in case you want to change the version, you can download the development libraries (see below) and extract from that package the runtime libraries. Microsoft Windows 7 and 10. 32bits and 64bits versions. Microsoft Visual Studio 2015 or newer. under System variables, look for PATH entry, edit it adding CRM32PRO_INST_DIR value. To develop applications or compile the examples using Visual Studio, we have to add the CRM32PRO_INST_DIR to the include and library paths. It is very important that runtime libraries on C/C++ code generation of Visual Studio will be set to "DLL multithreaded" (/MD switch) when you compile Release code or set to "DLL Debug multithreaded"(/MDd switch) when you compile Debug code.